Geri Mannion, director of Carnegie Corporation’s Strengthening U.S. Democracy program, shared her experience of the oath ceremony administered by Justice Ruth Bader Ginsburg at the New-York Historical Society on April 10, 2018. At Carnegie Corporation we are very interested in trying to address such gaps and to make connections. That’s why I encouraged the New-York Historical Society to connect with our grantee, the New Americans Campaign (NAC). The New Americans Campaign, which is overseen by the Immigrant Legal Resource Center in San Francisco, is a national network of immigration organizations, legal services providers, faith-based organizations, immigrant rights groups, foundations, and community leaders. The NAC works very hard to connect lawful permanent residents, who want to become U.S. citizens, with trustworthy advice and legal assistance. 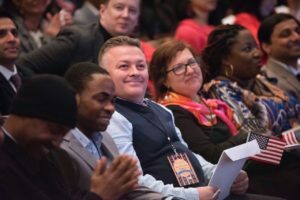 In this way, a very local program, like the New-York Historical Society’s Citizenship Project, can learn from a growing network of organizations across the country that support naturalization efforts — and vice versa. 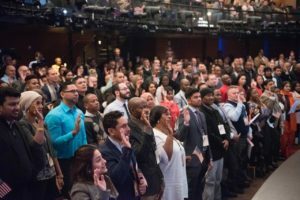 Last February, at the NAC national conference in Miami, more than 300 people, all devoted to helping people navigate the naturalization process, came from across the country to learn from one another and to share tools and best practices. We are delighted that over the last several years these disparate groups have truly joined together to create a united and supportive family of organizations.